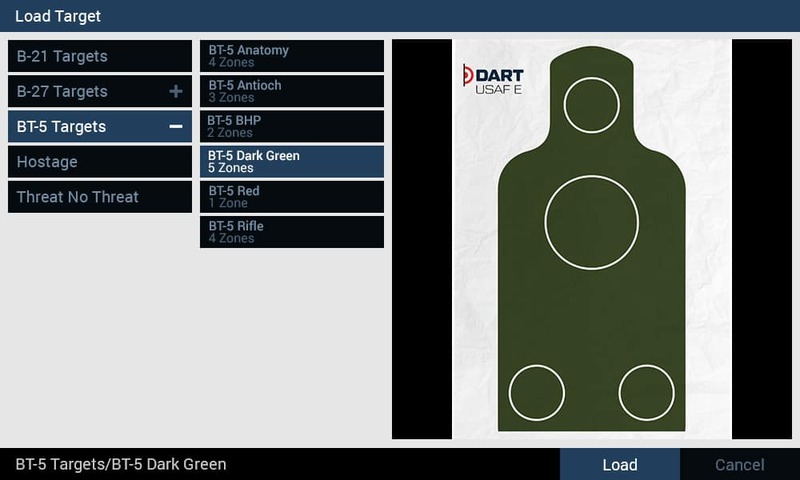 DART Range can run a wide variety of courses built with DART Creator or DART Studio. The Courses menu provides options for loading and running these courses, and running a basic practice course. This will run the currently loaded course. Running a course will reset all values, scores, and timers. After completing a course, you will be shown an After Action Review. Note: The side menu and certain keyboard shortcuts are inactive while running a course. An infinite variety of courses can be created in DART Creator and DART Studio software. 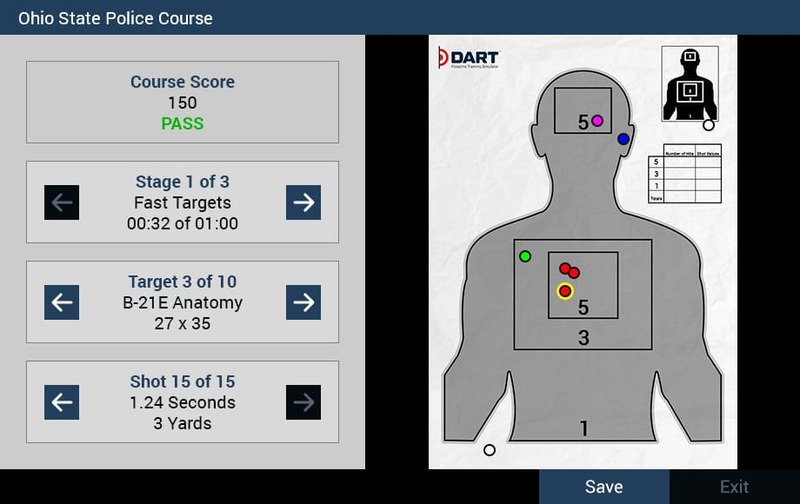 Those courses, with their varying targets, rules, and requirements, can be loaded into DART Range using the Load Course button. DART courses can be saved in different folders inside the DART Data/Courses directory. When you select a folder by clicking on a folder name in the left-hand column, a list of courses contained in that folder will appear in the right-hand column. Once you select a course, a preview image of the course will be displayed. Click the Load button at the bottom of the dialog window to load the selected course. Note: A plus (+) icon next to a folder name indicates that the folder contains additional sub-folders. Click the plus icon to open the folder and view its sub-folders. Clicking the minus (-) icon will close the sub-folders. There will be times when you want to practice shooting without the restrictions of a course. 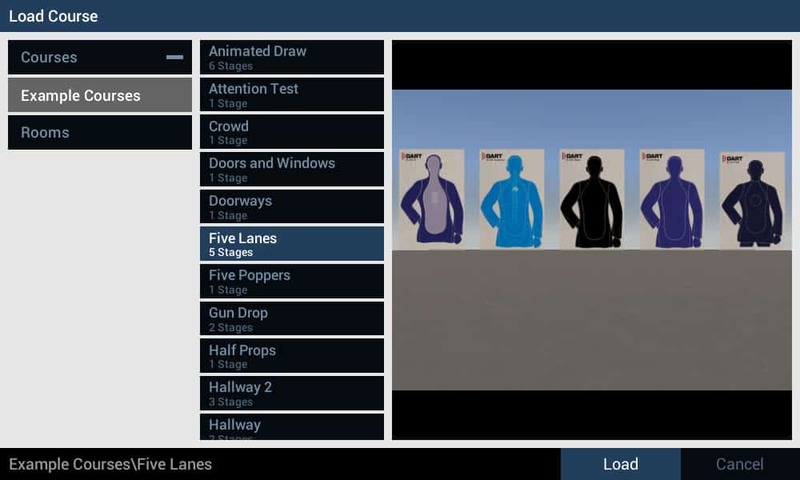 The Target Practice option allows you to quickly load any target and practice shooting with unlimited time and ammunition. Like courses, DART targets can be saved in different folders inside the DART Data/Targets directory. Once you select a folder by clicking on it, a list of targets contained in the selected folder appear. Once you select a target, a preview image of the target will be displayed. Click the Load button at the bottom of the dialog window to load the selected target. Clicking the Action Review button will open the After Action Review of the last completed course. Once a course ends, an After Action Review will automatically appear. The After Action Review allows you to step through each stage, target, and shot of the course and view shot placement, timing, and score. Shots are shown as colored circles which reflect the color of the target zone they hit. Displays the final course score and a PASS or FAIL grade based on the course settings. Shows the stage name and number containing the target currently under review, as well as the amount of time the shooter spent on the selected stage. Displays the name, number, and size of the currently selected target. Displays the number, timing, and target distance for the currently selected shot. Note: Shot detail only shows shots that hit a target zone. It will not show shots that miss the target completely. Saves a JPG image of the target currently being reviewed along with its associated shot markers. The image will be saved in the DART Data/Results folder and will include the date and time the course was run in the image name. Closes the After Action Review window. You can reopen the After Action Review window of the last completed course by selecting the Action Review button at any time. Note: Courses with a fixed number of shots or limited amount of time will end once either of those limits are reached. Courses with an unlimited amount of time and ammunition will never end. These types of courses are useful for practice, but will not provide a review screen as described here.